Update: 12/01/16. Sad news about Mr Bowie. I’ve given this a bit of an edit, but have resisted the temptation to soften it much. More a case of fleshing out things I just moved over in passing and would have explained more fully if I hadn’t knocked this piece out in an hour on a Sunday night. 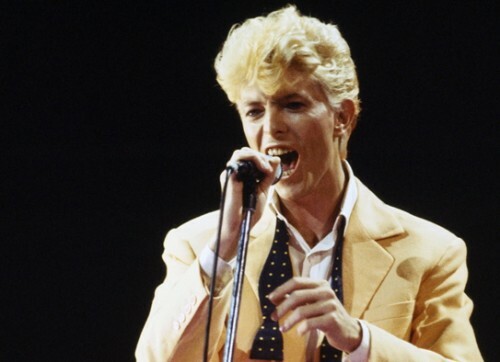 As a younger man, I had little time for David Bowie. As most music fans do, I derived a certain philosophy from the music I liked. I saw common attitudes and threads in the people who made it. Now, the musicians I admired were, almost without exception, unglamorous people, people for whom street clothes and stage clothes were the same thing. As a determinedly non-glamorous person myself, this seemed to me to be positively a virtue (signifying authenticity, sincerity and all that jazz), and it hardened into a dogma. A musician who was conspicuously concerned with visuals – to the point that they wore costumes rather than mere clothes, foregrounding the theatrical and performative nature of what they did – was not only inauthentic, but had to be less concerned with the music than they should be, man. (Yeah, I was a humourless little choad.) So David Bowie, a man who early on had built his career out of costumes and personas and haircuts and pseudonyms, was anathema. Didn’t get it, didn’t get what other people got from it. On a musical level, too, I wasn’t hugely impressed. The big hits of his early years still sound a bit messy, underpowered and half-baked to me, even when I admire the songs (and the harmonic and melodic accomplishment of songs like Life on Mars or Space Oddity are undeniable). The Spiders from Mars, a pub band from Hull, sound pretty much exactly like a pub band from Hull. Even the Aynsley Dunbar/Herbie Flowers rhythm section from Diamond Dogs sounds weedy next to Dennis Davis and George Murray, the magisterial duo who worked with Bowie on Station to Station, Low and ‘Heroes’. Hearing the second side of Low (particularly Subterraneans) at university opened me up to the idea that Bowie’s music could also be overpoweringly moving, as well as embarassingly am-dram. But the tipping point came a few years later, and hearing Sound and Vision on the radio. I didn’t recognise it (when I was played Low by my college friend Calum, he didn’t play me side 1), and was completely caught up in the intro groove. And then the vocal came in and, oh god, is this David Bowie? This was funky. It was soulful. If this was Bowie music, sign me up. Let’s Dance, the album, is a disgrace, one of the laziest and most contemptuous records ever released by a major rock performer. Its eight songs whizz by in an uninteresting and uninvolving blur and commit to nothing except Bowie’s need to be David Bowie for another year. I don’t agree, though his take-down of the record is brutally hilarious (particularly his characterisation of 1983-era Bowie as the Beckenham Young Businessman of the Year). The thing is, I don’t think Bowie has it in him to be lazy. Nor Nile Rogers, for that matter. And Let’s Dance is David Bowie and Nile Rogers and Tony Thompson and Rob Sabino (Chic’s drummer and pianist, respectively) and Omar Hakim and Carmine Rojas and Stevie Ray Vaughan and Bob Clearmountain. With that much talent in the room, killer moments are inevitable. It’s true that they’re mostly crammed into the first three songs (it’s hard to think of a record before the 1990s so front-loaded as Let’s Dance), and that the first track is the best. But those songs are hard to deny, and while some have heard them as clinical and calculating, I hear them as Bowie having fun with the same sort of R&B derived music he’d played early in his career with a succession of Mod bands. Modern Love is the hardest to deny. It’s “a Bowie cultural doom-piece like Five Years recast as a boogie, nihilism in the high key of Little Richard,” as O’Leary called it astutely. The rough edges of the lyric (modern love, traditional marriage, religion and humanism are all tried by the singer, and all found wanting) are smoothed over by Thompson’s all-time-great drum track, Sabino’s piano and Rogers’s guitar. Those backing vocals, meanwhile… Carlin called them “the stupidest backing vocals in pop since Sam Cooke’s Wonderful World”; O’Leary was also not a fan of them in the wider context of the album (“like a demented glee club”), but, again, I think he’s on the money when he describes how they work as “audience surrogates, chanting back whatever words Bowie feeds them, being driven along before him”. Lacking the iconic hooks of either Let’s Dance (the Twist and Shout build-up; those heavily echoed guitar-and-horn stabs) or China Girl (the Chopsticks guitar riff), Modern Love is nevertheless the most substantial single from Let’s Dance, and gives me exactly what I want from a David Bowie song and what he specialised in between 1975 and 1983: a hugely intelligent lyric coupled with a fantastic groove. This entry was posted in Music and tagged 'Heroes', Aladdin Sane, Aynsley Dunbar, Beckenham Young Businessman of the Year, Bob Clearmountain, Carmine Rojas, Chic, China Girl, Chris O'Leary, David Bowie, Dennis Davis, Diamond Dogs, George Murray, Herbie Flowers, Let's Dance, Low, Marcello Carlin, Modern Love, Nile Rogers, Omar Hakin, Pushing Ahead of the Dame, Rob Sabino, Scary Monsters, Sims Brothers, Sound and Vision, Spiders from Mars, Station to Station, Stevie Ray Vaughan, Subterraneans, Then Play Long, Tony Thompson, Twist and Shout, Young Americans on July 5, 2015 by rossjpalmer.